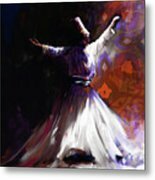 There are no comments for Painting 716 2 Sufi Whirl 2. Click here to post the first comment. 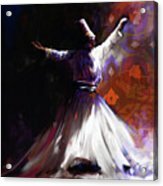 Sufi whirling (or Sufi turning) (Turkish: Semazen) is a form of Sama or physically active meditation which originated among Sufis, and which is still practiced by the Sufi Dervishes of the Mevlevi order and other orders such as the Rifa'i-Marufi. It is a customary meditation practice performed within the Sema, or worship ceremony, through which dervishes aim to reach the source of all perfection, or kemal. This is sought through abandoning one's nafs, egos or personal desires, by listening to the music, focusing on God, and spinning one's body in repetitive circles, which has been seen as a symbolic imitation of planets in the Solar System orbiting the sun. 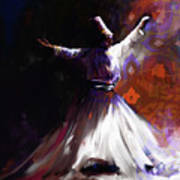 The Mevlevi practice gave rise to an Egyptian form, tanoura, distinguished by the use of a multicolored skirt. 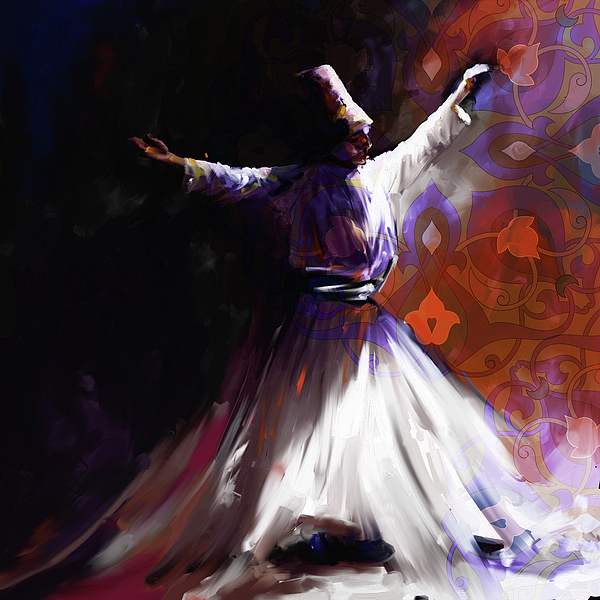 This has also developed into a performance dance by non-Sufis, including dancers outside the Islamic world. Painting medium is Acrylic Paints.